No12, built circa 1864 most likely in Portmadog. A very unusual waggon designed to carry coal and produce up the valley to the quarry and finished slate down to Porthmadog. They were horse drawn but could be loco shunted. They were not suitable for large trains as their light construction meant that they would most likely be pulled apart under the strain. 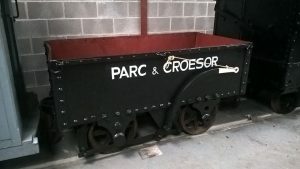 This waggon is extremely rare and this is the only surviving example to have brakes.